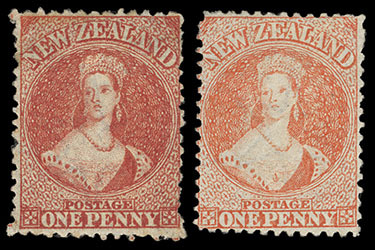 New Zealand, 1864, Queen Victoria "Chalon Head", 1d carmine vermilion and pale orange vermilion, perf 12½, Large Star watermark, each with strong color, nicely centered, carmine with disturbed o.g., orange unused without gum, F.-V.F. unused pair. Scott No. 31. Campbell Paterson No. A1m (1, 3). SG No. 110-111 £550 ($720). New Zealand, 1864, Queen Victoria "Chalon Head", 1d carmine vermilion, perf 12½, Large Star watermark, block of four (pos. R. 11-12/3-4) with R. 11/3 Re-Entry, o.g., lightly hinged, strong vibrant color and bright paper, fresh and Very Fine. Scott No. 31, 31 var. Campbell Paterson No. A1m (Y). SG No. 110, 110 var. £1,000 as singles ($1,310). 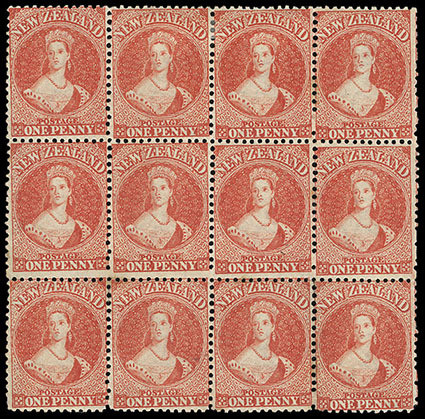 New Zealand, 1864, Queen Victoria "Chalon Head", 1d carmine vermilion, perf 12½, Large Star watermark, block of 12 (R. 15-17/1-4) illustrating the irregular alignment of the clichés on the plate, o.g., top two center stamps with hinge remnants, rest never hinged, well centered, strong radiant color, couple of tiny light tone spots, still fresh and Very Fine multiple. Scott No. 31. Campbell Paterson No. A1m (1). SG No. 110 £3,000 as singles ($3,940). A WONDERFUL SHOWPIECE AND LARGE ORIGINAL GUM MULTIPLE OF THE 1864 1D CARMINE VERMILION PERF 12½. 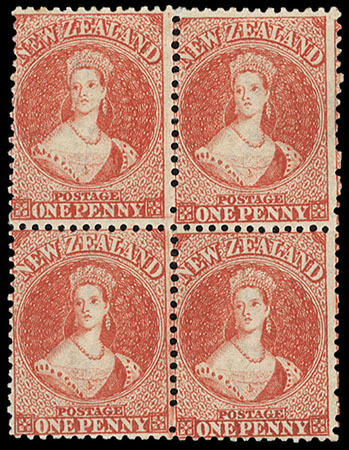 New Zealand, 1864, Queen Victoria "Chalon Head", 1d carmine vermilion, perf 12½, Large Star watermark, horizontal strip of four, strong color on bright paper, cancelled by numeral "7" barred ovals of Wellington, some small flaws incl. 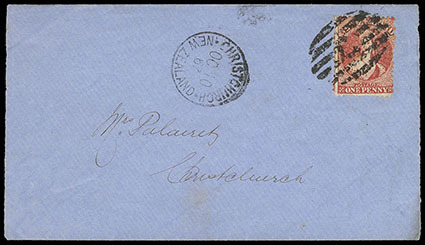 some creasing and left stamp with small tear at top, fresh and F.-V.F., scarce used strip. Scott No. 31. Campbell Paterson No. A1m (1). SG No. 110 £180 as singles ($240). Yeroc, J.M.A. Gregson, January 2000, lot 501. Scott No. 31 var. Campbell Paterson No. A1m (2). SG No. 110 var. Estimate $200 - 300. 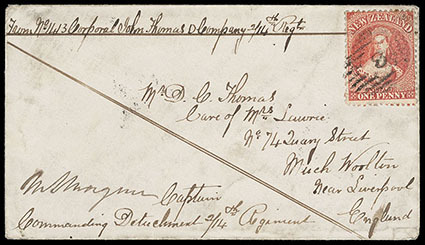 The 1d carmine paying the 1d rate for a town letter of up to ½ oz. from Jan. 1, 1867. The carmine shade is the least common of this shade group. Joseph Hackmey, Spink Shreves, February 2009, lot 1405; with 2000 and 2006 R.P.S.L. certificates. Scott No. 31. Campbell Paterson No. A1m (1). SG No. 110 Estimate $5,000 - 7,500. A REMARKABLE 1D SOLDIER'S LETTER USE DURING THE 2ND MAORI WAR COVER, ONE OF THE FEW STILL IN PRIVATE HANDS. 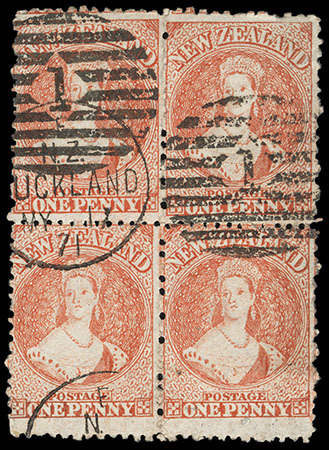 New Zealand, 1864, Queen Victoria "Chalon Head", 1d carmine vermilion, perf 12½, Large Star watermark, horizontal pair and two singles, used with 6d red brown (122), strong colors, tied by bold "Dunedin, MR 18, 65" cds duplexed with "Otago" barred oval on 1865 cover to London, England, endorsed "via Marseilles" at top left, red London (5.15) arrival backstamp, Very Fine and choice. Scott No. 31. Campbell Paterson No. A1m (1). SG No. 110 Estimate $500 - 750. 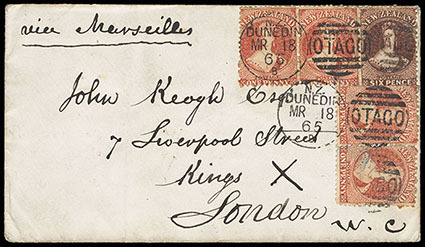 AN ATTRACTIVE FRANKING AT THE 10D RATE VIA MARSEILLES TO THE UNITED KINGDOM. 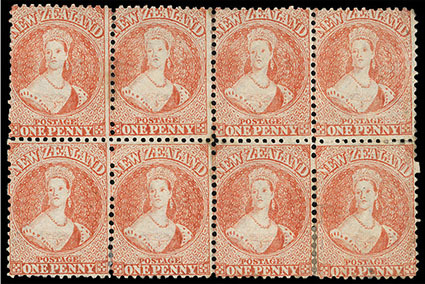 New Zealand, 1864, Queen Victoria "Chalon Head", 1d orange vermilion, perf 12½, Large Star watermark, block of 8 (R. 1-2/9-12), large part o.g., bright shade, some gum toning and reinforced perf separations, Fine and rare large multiple, Bernard Symonds, Spink, July 2007, lot 1447. Scott No. 31 var. Campbell Paterson No. A1m (3). SG No. 111 Estimate $1,500 - 2,000. New Zealand, 1864, Queen Victoria "Chalon Head", 1d orange vermilion, perf 12½, Large Star watermark, horizontal strip of three, well centered with bright color and paper, cancelled by "N. Plymouth, N. Zealand, NO 18, 1868" cds and numeral "6" barred oval, fresh and Very Fine. Scott No. 31 var. Campbell Paterson No. A1m (3). SG No. 111 £135 as singles ($180). New Zealand, 1864, Queen Victoria "Chalon Head", 1d pale orange vermilion, perf 12½, Large Star watermark, block of four (R. 19-20/6-7), bright color, cancelled by bold "1" barred oval duplexed with "Auckland, MY 17, 71" cds, upper right stamp creased, fresh and Very Fine, a scarce used block. Scott No. 31 var. Campbell Paterson No. A1m (3). SG No. 111 Estimate $200 - 300.